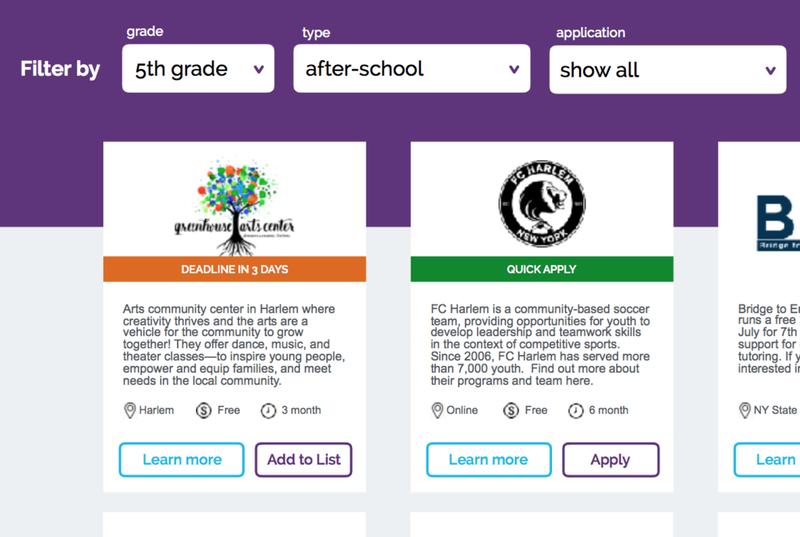 Please meet the PASSNYC Opportunity Explorer, a universal application and smart catalog of NYC’s most exciting extracurricular opportunities for students. The city's leading providers of test prep, extracurriculars and scholarships are looking for NYC's brightest students. But busy parents don't have the time to wade through hundreds of applications. The PASSNYC Opportunity Explorer is our answer. Inspired by the ground-breaking Common App, which has changed the game for college admissions, we've set out to make it easier to access NYC's top educational opportunities. We're proud to announce that the Opportunity Explorer was selected as a Grand Prize winner at BigApps NYC 2017, from over 150 eligible submissions! Learn more on our blog. Find everything from test prep and tutoring to basketball camps and dance clinics. Fill out one 15 minute application and apply for almost any program on the site. Keep track of your applications and never miss an upcoming deadline. PASSNYC Opportunity Explorer is not available, yet. Be the first to hear when it launches. Sign up below! We'll be in touch as soon as we launch!